Massachusetts Sen. Elizabeth Warren, known for her longstanding and ambitious campaign to even the scales of wealth in the country, unveiled a proposal to tax big corporations by closing loopholes that allow them to pay zero federal corporate income taxes. Her new big proposal, she writes in a Medium post published Thursday, "will make our biggest and most profitable corporations pay more and ensure that none of them can ever make billions and pay zero taxes again." The progressive stalwart seeks to bolster small businesses trying to "compete with the giants," she said in the announcement, by leveling the playing field and requiring the country’s most profitable companies to pay their fair share. Under Warren’s plan, companies would have to pay a 7% surtax on profits exceeding $100 million on top of other federal taxes. "This new tax only applies to companies that report more than $100 million in profits -- about the 1200 most profitable firms in the country last year," she explained. "That first $100 million is left alone, but for every dollar of profit above $100 million, the corporation will pay a 7% tax. Any company profitable enough to hit the Real Corporate Profits Tax will pay that tax in addition to whatever its liability might be under our current corporate tax rules." 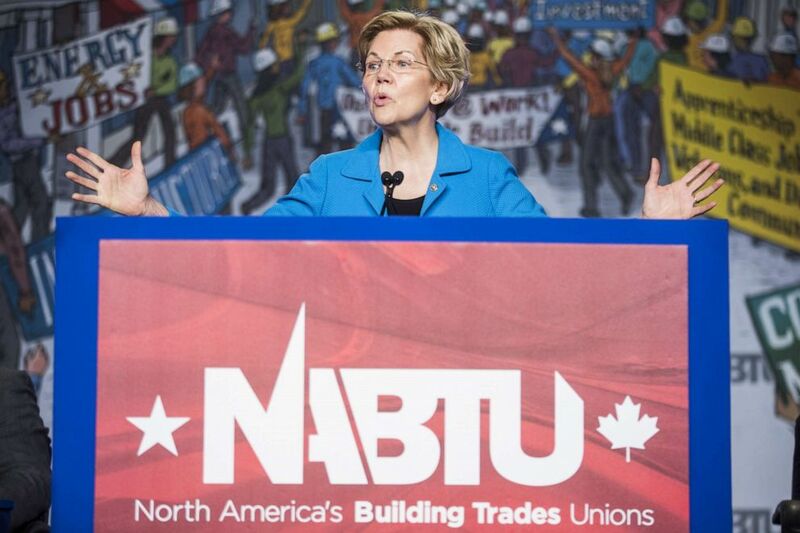 Sen. Elizabeth Warren (D-MA) speaks during the North American Building Trades Unions Conference, April 10, 2019, in Washington, D.C.
"Amazon reported more than $10 billion in profits and paid zero federal corporate income taxes. Occidental Petroleum reported $4.1 billion in profits and paid zero federal corporate income taxes," she said. An Amazon spokesperson responded to Warren's pitch, saying in a statement, "Amazon pays all the taxes we are required to pay in the U.S. and every country where we operate, including paying $2.6 billion in corporate tax and reporting $3.4 billion in tax expense over the last three years. Corporate tax is based on profits, not revenues, and our profits remain modest given retail is a highly competitive, low-margin business and our continued heavy investment." Warren isn’t the first 2020 candidate to condemn Amazon. Vermont Sen. Bernie Sanders, another progressive loyalist, responded to a news report that the tech giant will pay $0 on its profits, writing in a tweet, "If you paid the $119 annual fee to become an Amazon Prime member, you paid more to Amazon than it paid in taxes." In the Medium post, Warren boasts that the small tax at the core of her plan will generate "big new revenue." The post adds that according to an estimate from economists Emmanuel Saez and Gabriel Zucman at the University of California-Berkeley, the tax will bring in $1 trillion in revenue over the next ten years -- just from the massive profits of the thousand or so richest companies in the country. "Let’s bring in the revenue we need to invest in opportunity for all Americans," she writes. "Let’s make this year the last year any company with massive profits pays zero federal taxes."